Seether is a post-grunge/alternative metal band that was formed in 1999 in Pretoria, South Africa. The band is currently signed to Wind-up Records and Musketeer Records. Originally named Saron Gas and signed to Musketeer Records in South Africa, the band changed its name with the 2002 release of Disclaimer, its second album and major label debut. Change isn’t easy. But Seether vocalist, guitarist and songwriter Shaun Morgan understands that nothing worth accomplishing ever is. “When I was in rehab in 2006,” he recalls, embracing a sense of humorous selfawareness that comes with hindsight, “I learned that the definition of insanity is doing the same thing over and over and expecting a different result.” In other words: evolution is key not only to surviving but also thriving. It’s a way of thinking that Morgan applies to both himself and to the way his band operates. In a career that’s spanned nearly a decade, the power trio of Morgan, bassist Dale Stewart and drummer John Humphrey that is collectively known as Seether has toured the globe on the strength of five Gold and Platinum-selling albums: steadily growing a devoted fan base while continually pushing creative boundaries. Seether breaks new ground again with its fifth studio LP, Holding onto Strings Better Left to Fray, due out on Wind Up Records in May 2011. As fans and critics are about to hear, change is good. Holding onto Strings Better Left to Fray further expands on the dynamic musical growth curve heard on Seether’s 2007 release, Finding Beauty in Negative Spaces, while maintaining a sonic imprint that is undeniably Seether. There are many reasons to be excited. 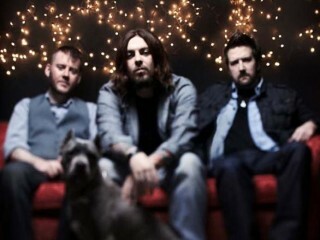 Not only does Seether branch out stylistically on the album’s first single, “Country Song” – which blends a buoyant, aurally addictive hook with the band’s signature searing guitar work – but the singer’s striking new vocal approach is audible from the album’s exhilarating lead track, “No Resolution.” Morgan explains, “On this album, I didn’t scream very much, because that’s not what I wanted to do. For some of the songs, the sentiment behind the lyric wasn’t angry, therefore to sing it in an angry way didn’t make any sense to me. The gritty stuff is easy to do, but it also feels really great to convey emotionally, through my voice, what I’m trying to say, instead of just being a one trick pony.” The result is a collection of compelling vocal performances that conjure an appealing blend of two of Morgan’s chief influences, Kurt Cobain and Tool’s Maynard James Keenan. It makes Strings an immensely satisfying listening experience. Looking back on Seether’s career path, it’s not surprising that the band has progressed to this juncture. Originally founded in Johannesburg, South Africa, by Morgan and Dale Stewart, Seether made its initial impact on U.S. hearts and eardrums with 2002’s Disclaimer. The album’s first single, “Fine Again” was a pensive ballad whose minor chord message of sustaining hope amidst turmoil resonated with fans worldwide. “Fine Again” was featured on the soundtrack to the popular video game Madden 2000, and Seether gained nationwide live exposure with a spot on that year’s Ozzfest tour. After releasing the singles “Driven Under” and “Gasoline,” Seether rerecorded the acoustic track “Broken” as an electric version featuring Evanescence vocalist Amy Lee. “Broken” became a massive international hit for the group. In 2004, Seether remixed and remastered Disclaimer, adding eight new songs and new cover art to create the two-disc set Disclaimer 2, which went Platinum. In 2005, Seether released Karma & Effect (the band’s only album recorded with guitarist Pat Callahan), which debuted at #8 on the Billboard chart. “Karma & Effect is my favorite representation of us at radio,” Morgan offers. “The singles we’d released previously were ballads, but this time, we chose “Remedy,” “Truth” and “The Gift” as singles. Those songs, and their accompanying videos, were darker and more ominous, so we knew that fans coming to our shows wouldn’t be surprised when the band was actually playing loud, heavy music.” Morgan credits the album with solidifying Seether’s identity as a hard rock act. At this point, the band was promoting itself at radio stations; performing brief, “un-plugged” sessions for fans. From that effort, a demand grew for recorded copies of those acoustic songs. “We decided that we would record a live, acoustic album during one night off ontour and see what happened,” says Morgan. That set, recorded at a Philadelphia pub, became the live CD/DVD One Cold Night, released in 2006. Another favorite is “Roses” – also a clear choice for a single – that Morgan claims was influenced by the band Muse. “I love how it starts with the very ominous Phantom of the Opera piano, and then goes into something completely different, with constant movement,” he says. The band is also proud of “Here and Now,” a modern rocker infused with a classic pop feel that might fit easily within the discography of Cheap Trick. “We wanted to write songs that would stand the test of time rather than just be music ‘of the now’ – meaning what is popular in this particular two- or three-year cycle” Morgan explains. “Here and Now” also features the lyrics from which the album title was culled.